﻿ Areumdaun Resort, Jeju Island | FROM $27 - SAVE ON AGODA! "The hotel room had a very good seaview!" Have a question for Areumdaun Resort? "The rooms were clean and spacious for a group of 3, and the staffs were friendly and kind." "Room is spacious with cooking facilities." "The room is spacious, quite, with great sea view." Well-placed in the family fun, beaches, sightseeing area of Jeju Island city, Areumdaun Resort provides a most conducive spot for you to take a break from your busy days. The hotel is not too far from the city center: just 0.30 Km away, and it normally takes about 45 minutes to reach the airport. 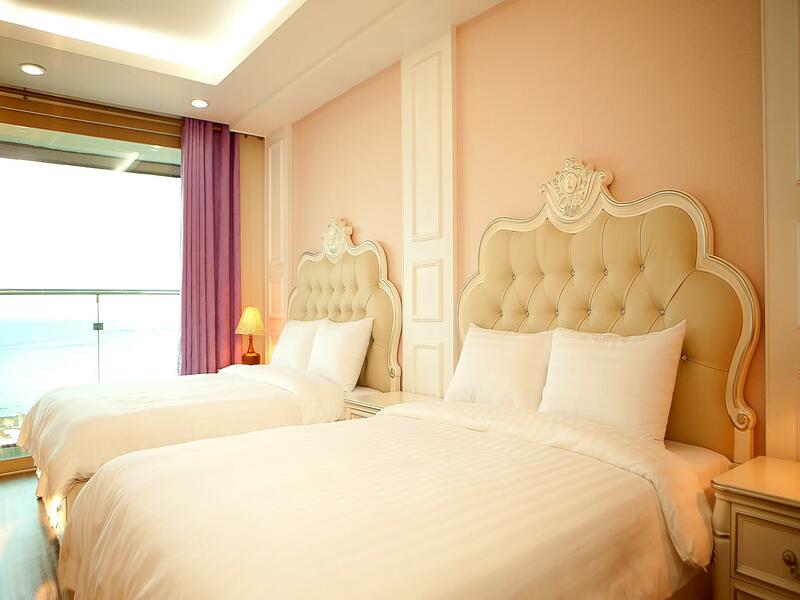 No less exceptional is the hotel's easy access to the city's myriad attractions and landmarks, such as Dongamsa Temple, Seongsan Ilchulbong Peak, All In House Theme Park. At Areumdaun Resort, every effort is made to make guests feel comfortable. To do so, the hotel provides the best in services and amenities. To name a few of the hotel's facilities, there are free Wi-Fi in all rooms, facilities for disabled guests, luggage storage, Wi-Fi in public areas, car park. Experience high quality room facilities during your stay here. Some rooms include television LCD/plasma screen, internet access – wireless, internet access – wireless (complimentary), non smoking rooms, air conditioning, provided to help guests recharge after a long day. Whether you're a fitness enthusiast or are just looking for a way to unwind after a hard day, you will be entertained by top-class recreational facilities such as private beach, garden. 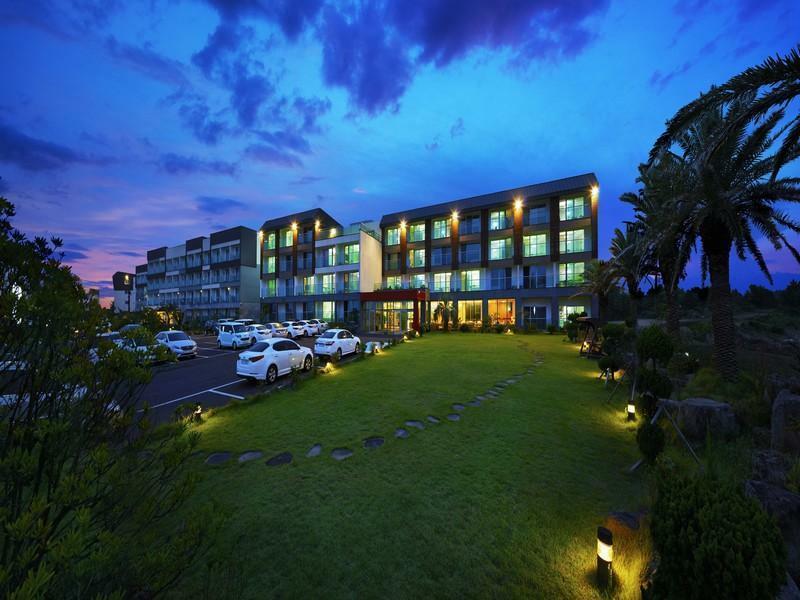 Areumdaun Resort is an ideal place of stay for travelers seeking charm, comfort and convenience in Jeju Island. "Beautiful ocean view from my room." Value for money. Beautiful ocean view from my room. Spacious room. Comfort bed. Complete kitchenette and utensils.. They didn’t provide big bath towel.. bring your own. Overall , nice hotel. Will stay again in future. Located outside of city. Quiet area with very good views and balcony. However, for the price you could do better. We all know of the asian breakfast but this place has taken it to a new low. Their oranges were even suspicious. The room is spacious, quite, with great sea view. Road towards the hotel is dark at night. I missed the hotel a few times, after came back from dinner. The resort location is facing beach and its really quiet. I dont even think there is a public transporation nearby so getting there without renting a car is bad idea. The room size is HUGE but not that luxurious although I can say its comfortable. there isnt much restaurants or attraction nearby, which again reiterates how much you need to rent a car there. Nearby there is a good chopped noodles that has great steamed dumplings! Overall it was a good visit since the hotel is perfect for couples! Difficult to find the location, phone number cannot be found in gps. Many parking lots are available. Not recommended if you are not driving in jeju. Near to the attraction, sunrise peak. The room is clean and spacious, very cosy and comfortable. Staffs can speak in simple English. Chose this hotel because we planed to go Seongsan Sunrise Peak for sunrise. It's around 15mins driving distance and lots of restaurant available with 5 or 10mins driving. We tried seafood hotpot, seafood pancake and abalone porridge there and it was our best meal in Jeju. Kitchen is very clean and looks new. It will be better if hotel can provide bigger bath towel. The hotel room had a very good seaview! The location is good. The place is old and the bedroom walls have molds. We reached the hotel half an hour earlier than the check in time and the receptions(3 males) just ignored us until we approched them and was told to come back half an hour later for check in (we can see from outside that there are rooms available). Located less than 10 minutes drive away from the sunrise peak. Beautiful ocean view from the room. Cozy resort feeling. However, do note that this place do get fully booked and when that happens, parking lots maybe limited. Counter staff were friendly and helpful although their command of English is not superb. We checked-in after 10pm and was surprised to see our room card left on the counter with our names on it, without any staff attending to it. The reception closed at 10pm. They did not even try to inform us that they will leave our room cards openly at the counter. Brkfast was delicious, but was the same throughout the 3 mornings. Location is near seongsan ilchubong and seopjikoji, but far from everywhere else. If u are driving to this hotel, the road nearby is very badly-lited and dangerous after the sun sets. Room was spacious n clean though. Quite comfortable overall. Resort is not located near the airport, about an hour & a half drive. Room is well-quipped & looked pretty new (two comfy large beds, mini bar, variety of TV channels & a spacious toilet). Room cleanliness is acceptable. Variety for breakfast is limited, food selection is always the same. There's a mini mart & eateries nearby. The awesome thing is having our room facing the sea. The sea-view & breeze just soothes one's heart. If you're looking for a relaxing getaway, look no further. This is it! Areumdaun resort is the resort to stay at if you plan to hike up Seongsan Illchulbong to catch the sunrise and to explore the nearby Udo island. The resort is still relatively new and the rooms are large and well-equipped. The staff are also attentive and responsive. The staff service was excellent ( and this is the first time I made such good comment for the tens of reviews I submitted) The room we stayed had defect. They came to check it. They then offered another room upgraded without charging us further. They also gave recommendation on dining place and others. Excellent! The most important thing is that this hotel is not accessible by public transport. This is not an issue if you rent a vehicle, as GPS is pretty good, and it's easy to locate. It's really nice Sunrise Peak, about 15 mins drive, which we appreciated because we didn't have to wake up super early to try to catch the sunrise. It was cloudy that day though, but that's not the hotel's fault. What is a weakness of the hotel is that somehow in planning, it neglected to design storage space in the hotel room, so although there is a kitchenette, you can't actually unpack your luggage and are forced to live out of your bags. Also, as "condominium-style" accommodation, there is no housekeeping. Towels are changed and trash emptied once every two days. Also, reception closes at 10 and opens at 7 or 8. We were unaware of this and arrived at 10:30, but fortunately the very kind staff stayed behind and waited for us. Definitely a good stay, I wouldn't hesitate to return, although it is a good idea to stay at more than just here on a vacation to Jeju, as it is quite a distance to the west side of the island. We booked 2 Single Twin with Ocean View. The view from our balcony was perfect! it was only a 5mins drive to Seongsan Iichulbong Peak. Do wake up earlier to catch the sunrise, it worth the trip. The hotel have the sunrise timing at their reception. One of our best stays in Jeju!